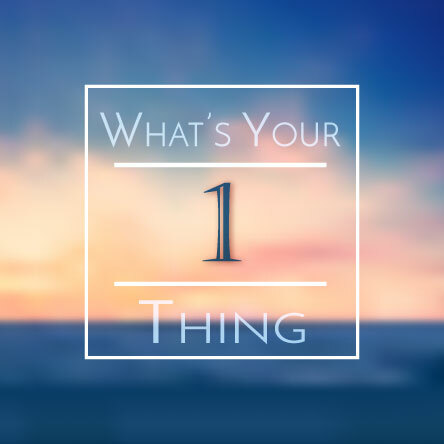 What is your one thing? What is the one item, goal, or point of focus that you are striving towards on a daily, weekly and monthly basis? More importantly are you pushing towards it or are the distractions of daily life getting in the way? How have you done over the summer on accomplishing your one thing for the year? Your one great priority? Have you moved the dial forward this summer? I’ll confess that I’ve spent a lot of time enjoying my summer and the time with my children. Therefore, I’ve ensured that to “earn” the right to do that daily, I hit on my one thing every morning. Even if it was just a touch in that day, I did push on it a little bit. You see, I’m a fan of Gary Keeler who wrote the book “The One Thing” and Darren Hardy. They both harp on the fact we need to move our goals forward every moment we can and that we need to focus on doing so. I wholeheartedly agree with them, I also like to enjoy my time, and my family so I want to ensure that my ONE THING, doesn’t become my ONLY THING to the detriment of everything around me. Here is what I do; to ensure I’m pushing my one thing along, on a daily basis. I set SMART goals yearly and review them often; this way I know what it is I am working towards. I ensure my goal reminders are up around my home and on my white board – I know what I’m driving for at all times. Every night before bed I look at the next days schedule just to refresh what I’m doing that day, and ensure the time for my one thing is there and uninterrupted and in the morning. I let NOTHING interrupt me when I am working on my one big priority, I try to get it done quickly and try not to work on it for longer than 90 minutes at a stretch. I do this Every. Single. Day. As a result, this is how I stay on top of my main priority. How do you stay on top of yours? Previous PostShaken, Not Stirred – Are you coming to the Expo? Next PostBrexit What does it mean to you and yours?